When you’re selling ice cream, you’re constantly challenged by the shifting dynamics of customer demand. You need a POS system that is simple to use, agile enough to handle heavy traffic, and powerful enough to track each detail of your business from anywhere. The ideal system is small, it can be learned in minutes, yet it provides robust inventory tracking down to the ingredient level and supports vendor interaction. It must be able to allocate staffing assignments to meet the ebb and flow of customer demand, keeping the lines moving. Of course, you’ll want to be able to process transactions in offline mode, receive almost any form of payment, and provide digital receipts. Because many shops are seasonal, a month-to-month commitment where you pay as you go is desirable. You’ll also need access to real-time analytics so you can leverage the data into customized marketing campaigns to grow your business. 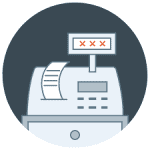 Additionally, a point-of-sale system should be able to manage your inventory, generate reports, and automate some tedious processes. All these features will help you run your ice cream shop more simply and more efficiently. This article will go through will help you decide which features are the most important to you. We also reviewed the three best point-of-sale systems for an ice cream shop. We hope these reviews will help guide you on your way to choosing the best point-of-sale system for your business! Shopkeep was not designed for ice cream shops specifically. It is used in many different industries and has many advantageous features for use in an ice cream shop. They make their point-of-sale systems highly customizable so you can add new flavors on a moment’s notice. They also aid in creating profit reports, and employee scheduling so you don’t have to worry about being short staffed during busy hours. Shopify did not grab our top spot but that doesn’t mean they aren’t an excellent point-of-sale system. They’re the most affordable option on our list so if you’re a small ice cream shop just starting to look into these systems, Shopify might be for you. They also have other features you’d expect from a point-of-sale system, such as customer management, integration with an online store, and inventory management. Shopkeep is a comprehensive POS system for ice cream shops. While they aren’t specialized for any one industry but offer a whole range of features for any retail shop. Their cloud-based service means you don’t have to manually synchronize your data across multiple systems or even have dedicated workstations. One of the best features of Shopkeep is its easy-to-use point-of-sale. In the fast-paced environment of an ice cream shop, the point-of-sale should not make any transactions more complicated. Shopkeep keeps the process streamlined yet very functional. It’s also highly customizable. When you come up with new flavors or toppings you can easily add them so there is no need to manually ring things up. If you have a customer who is changing their order size, or add-ons, Shopkeep allows you to adjust the orders on the fly to not slow you down. Another great feature is inventory tracking. Shopkeep allows you to have a database of your entire inventory of raw goods and materials. There’s also automated alerts and reports built in. If you start running below a certain threshold of an item, it’ll trigger an alert letting you know you should get more. Other reports show you which products are most popular and can give you daily comparisons of products. Along with their reporting, they also have customer management. With this feature, you can help build relationships with your customers by having records of previous orders. It tracks behaviors and can help you collect information. By gathering customer’s emails you can create targeted email marketing campaigns or attach promotions and social media links on digital receipts. Having a good relationship with your customers has shown to help boost sales and increase customer satisfaction. There are also several other features that make Shopkeep our number one pick. Their employee management system can use profiles to designate which tasks and data a certain employee can access. This also helps you manage employee hours and transactions. Occasionally when there is an internet outage, Shopkeep can keep accepting transactions and will synchronize with the cloud once internet access is restored. Shopkeep is a fully integrated solution. There’s no need to worry about the technical aspects of setting up each feature as it’s all integrated as one package. With their streamlined approach, you don’t have to worry about anything getting in the way and slowing down your transactions. Shopkeep runs with a month-to-month service at $69/month. There are no contracts so if you’re a seasonal business you can cancel for any period of time without any fees. They also do not have tiered contracts so for their one price you get all the features they offer along with 24/7 phone and email customer support. With their cloud service, there are no workstation fees. They also integrate with third-party hardware or you can purchase one of their bundles. Their basic bundle starts around $900 and includes a cash drawer, receipt printer, iPad holder, and Bluetooth credit card reader. Shopkeep is designed for single-location stores so linking multiple locations is challenging to say the least. Another limitation is that Shopkeep will only work in iPads. If you prefer Android or PC then you will not be able to use Shopkeep. 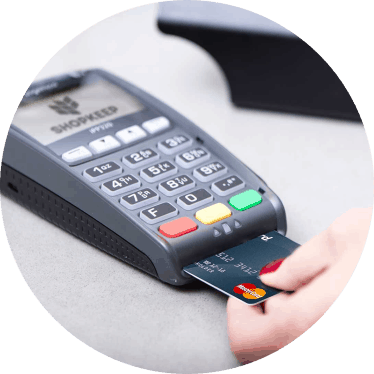 Shopkeep is a trusted point-of-sale system in the retail industry. Their packed features list, cloud-based service, and competitive pricing are what put them ahead of other point-of-sale systems on this list. They also have a history of success with other ice cream shops. Shopify is an economic point-of-sale system that is still able to compete against it high priced competitors. As Shopify was originally started as an e-commerce solution, their point-of-sale easily integrates with your Shopify online store. Their point-of-sale system is simple and requires very little training to be familiar with it. On top of working on any iPad, it also works on an iPhone, bringing even more portability to their system. Their checkout system also comes with all the necessary features you’d expect. You can easily add custom discounts, store credits, split payments, and gift cards. Shopify also has a powerful analytics tool. You can view, analyze and export sales reports by staff, location, time period or customers. If you’re interested in which product is performing the best, they have a report for that. If you don’t have the time to analyze reports, there’s a dashboard that quickly shows you orders and sales. You’re also able to see this dashboard right from your phone so you’ll never have to be away from critical business data. Their integrated tools also help you manage your stores and customers. Their information syncs directly with Quickbooks and other accounting software. With their order tracking, you can issue refunds, view order history, and search by customer product or date. Customer management is also available. You can create customer profiles and sync them both online and retail. Knowing your customers' habits you can create custom marketing campaigns. An additional feature on Shopify is the ability to track your customer's purchasing. This is especially beneficial when you consider Shopify's discount feature. Shopify allows you to create rule-based discounts. In other words, you can set up an automatic discount for veterans, teachers, senior citizens, children, etc. However, you can also dictate the rules, or dates, for sales in your store. This can be applied to multiple stores, which adds strength to Shopify's discount feature. 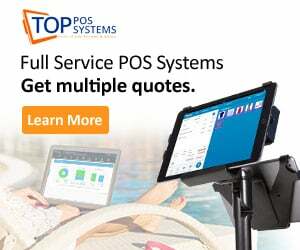 Most POS systems on the market today offer excellent customer service. This normally includes 24/7 service speaking to a live representative. Often your problems are solved in mere minutes. However, Shopify makes this standard customer service seem outdated. Instead of just the ability to speak to a help desk employee, Shopify provides many other services. There are college-level courses you can take on retail, allowing you to grow and stretch yourself as an owner. They also provide forums to discuss with other shop-owners. This is often beneficial as you can find out what has and hasn't worked in other stores. The final excellent feature is that Shopify provides you with access to experts who will help you set up your Shopify account. As many retail owners purchasing a POS are doing so for the first time, it can be well worth it to purchase a POS that helps you set up your information. Shopify has several pricing packages. Their cheapest package is only $29/month. They have more expensive packages that scale accordingly. The lowest tier package has a limit of two staff accounts and has some limited features. This is very powerful if you have more of an online presence. If you prefer the retail space more, then you can add their retail package for $49/month extra. This gives you the ability to interact with hardware and gives you the staff management feature. Shopify is a great option for those that want to add e-commerce. Even without the e-commerce option, Shopify has many great features that any other point-of-sale system has. If you’re a small ice cream shop trying to determine if a point-of-sale system is for you then Shopify might be a good place to look. Their economic plans are much cheaper than competitors and can introduce you to the use of one of these systems. Bindo is one of the best mobile point-of-sale systems. It has many innovative features and is competitively priced. They do not have a custom solution for an ice cream shop but the features Bindo offers makes up for it. One of the most innovative features to Bindo is its inventory management. Their Simple Scan Technology allows you to quickly add new products by scanning the barcodes. The system will automatically populate the products information like name, descriptions, photos and other data. This helps saves you time where you would normally have to import all this manually one by one or in a spreadsheet. On top of this, Bindo also tracks inventory and has a product matrix that makes it easy to add flavors and sizes to items. It also generates low-inventory alerts and allows you to create purchase orders. Bindo’s customer management system is an impressive feature. Their system can automatically generate customer profiles from credit card swipes and you can add customer photos that help you identify your best customers. It also has a built-in customer loyalty program that tracks spending and rewards points. You can specify how you want the points calculated, whether it’s based on the amount purchased, the number of orders or number of products purchased. Bindo also integrates with third-party email companies, allowing you to create targeted mailing lists and marketing campaigns. On top of all these features, Bindo is also a great point-of-sale. There are over 300+ features you can use with your register. Form invoicing to time clocks Bindo will never cease to impress with its features list. As with any good point-of-sale Bindo comes with a packed analytics and reporting tools. Viewing sales reports, income analyses, and top performing products you can see exactly how to grow your business. 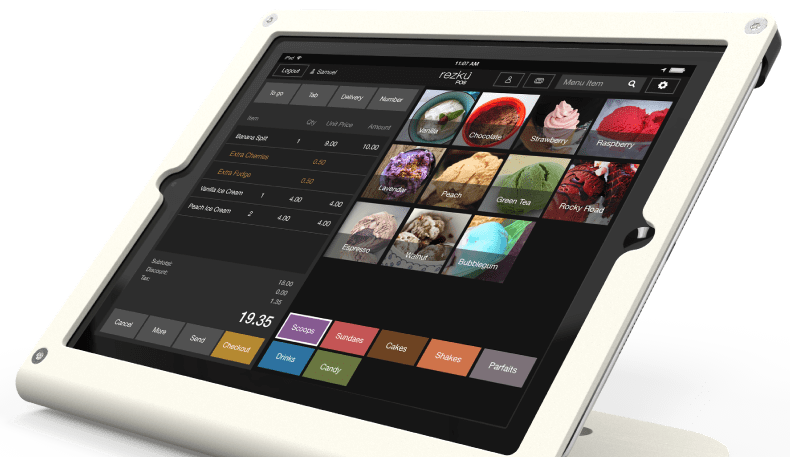 Bindo is also a POS system for ice cream shop retail which allows the owner or manager to check their store's information from any device. This is incredibly important because often owners are bouncing between stores or traveling in order to promote the store. Owners also often spend time purchasing their inventory. Being able to access your data on any device is a great feature, but Bindo takes it up a notch. Bindo also allows you to access multiple stores on the same account. This means it takes a few seconds to check and see if all of your stores are functioning efficiently. Bindo’s pricing is on par with most of its competitors. Its monthly software subscription starts at $59/month for a single register. Bindo also integrates with third party hardware so you can shop around and find the best deals. They do not offer flexible month-to-month service, instead, they require you to sign a contract for at least a year. If you decide to cancel early some agreements come with a cancellation fee. Bindo is a feature rich platform that works well with any retail business. Even though they don’t have a specialty for an ice cream shop, their adaptable systems would still be useful. We would recommend Bindo if you’re a larger ice cream shop and you want the more comprehensive inventory and customer management features. The yearly contract can also be a downside if you’re a smaller shop or only operate seasonally. There are lots of point-of-sale systems out on the market. Some have specialties for ice cream shops but there are hundreds of retail systems that would also be a great fit. For a small business owner trying to decide which point-of-sale system to choose, the task can be overwhelming while trying to simultaneously run your business. We strongly recommend Shopkeep for your ice cream shop point-of-sale system. Their features list is impressive and they have success with ice cream shops. If you’re looking for a more economical solution then Shopify might be a better option to consider. Their most economical options are fairly inexpensive. Or if you’re a larger ice cream shop with multiple locations then Bindo might be the better solution with its more advanced inventory management. You could read through all the point-of-sale system reviews there are. Or maybe read through the feature lists on their websites. Instead, you can let us read through all these reviews and then read our reviews of the best point-of-sale systems available. By reading our reviews you can save a lot of valuable time that you could otherwise spend on running your business. No matter what system you decide is best for your ice cream shop, you can make sure that one of the three mentioned in this review will be worth your time!